This shot features two buildings facing one of the many canals in the city of Bruges. 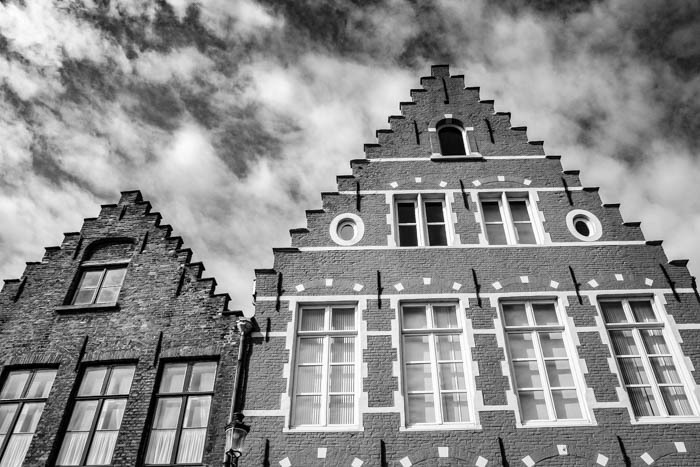 They have that elegant stepped gable feature, typical of so many buildings constructed in the medieval-to-Renaissance era in the Low Countries. Bruges is in Flanders in the Flemish region of Belgium, and is one of few European cities to have emerged relatively unscathed from the two World Wars that ravaged the continent, despite being occupied by enemy forces during both conflicts. Naturally, to a photographer with a particular interest in architecture, this is a place of endless fascination and photo opportunities. I shot hundreds of photographs on this visit and would like to go back and take more. I have used a wide-angle lens to get both facades in one shot and to create that sense of steep respective that gives the buildings that feeling of height and awe. Closer to home, in Somerset, Dorset or Wiltshire – or indeed further afield if you wish – if you need an architectural photographer, please get in touch.